Living far from the ones you love is tough, especially for seniors who may need extra care or assistance in order to keep things running smoothly at home. 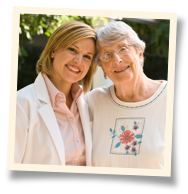 Professional in-home care providers referred by Visiting Angels® Delray Beach can be there when you can't to offer a helping hand and a shoulder to lean on for your loved on in Boca Raton. It's the perfect way to help an elderly or disabled loved one continue to live independently at home. No two seniors are exactly alike, and so naturally, each family has their own unique requirements when it comes to their relative's care. With Visiting Angels Delray Beach in their corner, your loved one can overcome any obstacles in their path, whether they're related to memory loss, loss of vision, or just a lack of companionship. If you've been considering getting living assistance services for your loved one in Boca Raton, Delray Beach or Boynton Beach but haven't been sure, there is an easy and convenient way for you to find out more. A Client Services Advisor from our office will meet with you at your convenience. It's a stress-free opportunity to talk with a knowledgeable professional about all your concerns and ask any questions you may have. There's no pressure to make any decisions at that time, but if you do choose to move forward, they can begin to work with you to find a Professional Caregiver that will help to improve your loved one's quality of life across the board. In addition to Boca Raton, we also proudly serve the communities of Boynton Beach, Delray Beach, Coconut Creek, Coral Springs, Deerfield Beach, Lighthouse Point, Royal Palm Beach, Margate, Palm Beach, Parkland, Wellington, Lake Worth, and the surrounding areas. Call Visiting Angels Delray Beach today at 561-865-9040 for more information on in-home care referrals.